Places throughout the rest of the Country that claim to make Philly Cheese Steaks just do not get them to taste the same, and one of the reasons is that they do not use extra-virgin olive oil. Anyone who says that Pat's and Gino's in South Philly uses Cheez Wiz, is talking about the way they make it now. The old authentic way uses Provolone Cheese. Also, using deli roast beef is the same as using top round sliced wafer thin or frozen Rib-Eye roast shaved on an electric slicer. We are talking about authentic, not the way they are made now. If you make any changes with the ingredients or the directions, it will not be the same. Make it EXACTLY as written here. Heat a griddle or a large saute pan over medium-high heat. When hot, cover bottom with olive oil. Add the onions and bell pepper and cook, stirring, until carmelized, which will take about 6 to 8 minutes. Add the garlic, salt and pepper, and cook for about 30 seconds. Then, push the mixture off to one side of the griddle. Add the meat to the hot part of the griddle. Cook, continuously flipping the meat over and slightly chopping the meat into slightly smaller pieces with 2 spatulas, until the meat is not pink, which should take about 2 minutes. 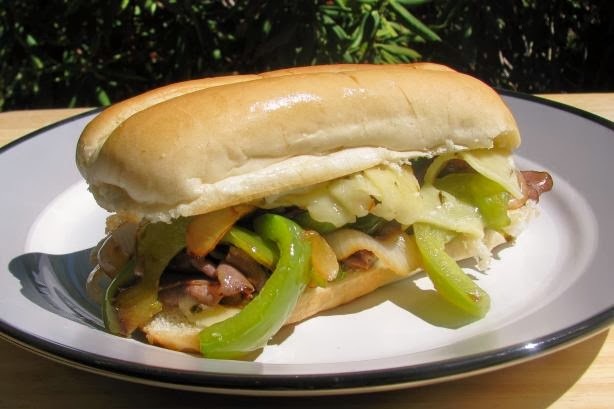 Mix the meat and the carmelized onions and bell pepper together. Divide into 2 portions, and top both portions with the cheese to melt. If using Italian or French bread, cut the bread in half, crosswise, and slice lengthwise to open for the 2 sandwiches. Hollow out some of the soft white bread part from inside and place face down on top of the meat and cheese. When the cheese is melted, and with 1 or 2 spatulas, flip the sandwiches over and add topping, such as marinara sauce or ketchup, if desired, and serve immediately. 0 Response to "Philly Cheesesteak Sandwich (Authentic) "